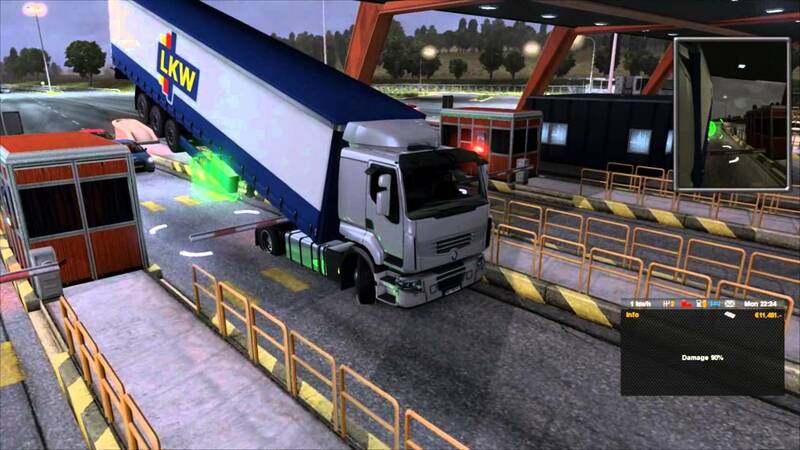 Tolls gates are automated toll booths in the game. They are most common in the country of France but can be occasionally found in Poland and Italy. The player can become aware of a toll both beforehand by a golden icon on the map. There is usually a rest stop before or after the gate. Drive up slowly to the floating green then press Enter or the current customized key. The gate will open, and you will be either be charged right there and then or you will be charged once you leave the highway. Fees are always different and depend on the length or area of the toll road. If you are employed via a quick job your employer will pay for the expense. If you attempt to proceed through the gates without paying by the car in front of you the gate will begin to close on your truck. Your truck and/or will most likely take damage. There is a slightly small chance (it has happened to one of our staff members) that you will throw out of the gates with excessive force and receive very high and damage and face being thrown out of map. If you do succeed through the gates without paying you will be fined a red light offence ticket, facing taking damage to both your truck or trailer, and risk having your rig tip over. Current time: 04-18-2019, 05:16 AM Powered By MyBB 1.8.20, © 2002-2019 MyBB Group.